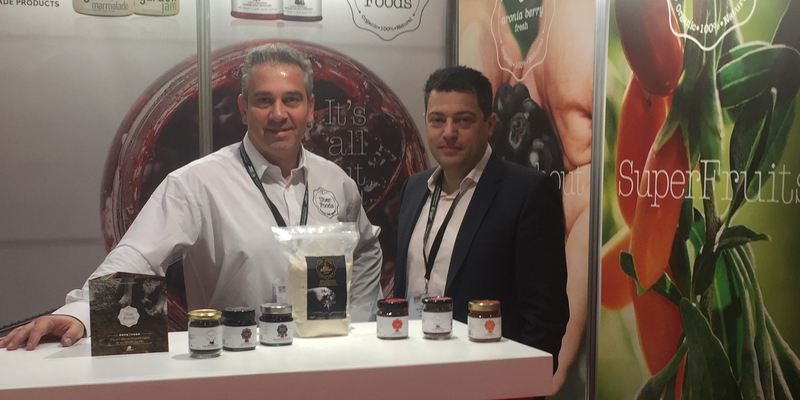 SunPark’s presence at the international Organic Products trade show in London (NOPE 2017) was highlighted by the launch of “Uber Foods“, our new line of certified organic super-fruit and raw food products, sourced directly from our owned farms in Greece. SunPark_Team_NOPE2017_LondonUber Foods product line includes organic goji berry, chokeberry (aronia) and sea berry (sea buckthorn or hippophae) super-fruits that come in delicious fresh and dried forms as well as jam in exquisite combinations. Also, under Uber Foods product line, SunPark introduces in the market 2 new amazing organic superfoods: raw honey with goji berries and Zeas Emmer (Spelt) wholemeal flour.